When you think of comic books being turned into visual media, do you think of cartoons or cheesy stunts? Well, for all the comic book lovers out there, a solution has arrived in a relatively little-known actor and a vigilante who has been in the comic book world since 1941. Summary: Arrow is based off the DC comics’ character Oliver Queen, aka Green Arrow. A spoiled billionaire, Oliver (Stephen Amell) does not think twice of cheating on his girlfriend, Laurel Lance (Katie Cassidy) with her sister, Sara. Planning a trip with his father on their personal boat, Oliver invites Sara along without Laurel’s knowledge. While en route to their destination, Oliver, his father and Sara shipwreck in the middle of a terrible storm. Oliver is the only who makes it to an island called Lian Yu, or “Purgatory.” After five years, he is rescued by some fishermen and returns home to Starling City with physical and mental battle scars. Amid the struggles of reconnecting with his family, friends and Laurel, Oliver embarks on a mission to fulfill a promise he made to his father. Using a list of names his father left him, he targets wealthy citizens who have committed crimes against Starling City, bringing them to justice with the help of a disguise, money, and a bow and arrow. The mystery surrounding the fact of how he became a professional archer is revealed in spurts as his adventures on the island are intermixed with current events. Meanwhile, Oliver makes allies with John Diggle (David Ramsey) and Felicity Smoak (Emily Bett Rickards), who promise to aid him in his endeavors to save Starling City from destruction. By the end of season one, however, Oliver’s mindset and goals change due to events surrounding the future of Starling City. The second season has a shift in focus as foes from his past come seeking vengeance and friends come back from the dead to fight alongside him. 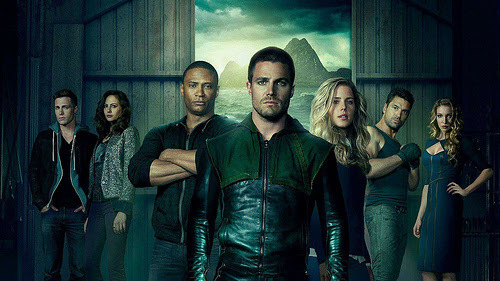 Review: Through fast-paced action scenes, drama, and romance, Arrow has grown from a series that showed potential to a phenomenon around the world. Comic book fans of Green Arrow do have some protests, as several characters in the show are not a part of the original comics. However, the show has many allusions to other DC comic book characters, making the viewer appreciate the time the writers took to reconstruct the DC universe in a live-action television show. The plot, acting, and the stunts improve tremendously as the series develops. The novelty of the show does not stop there, however. Unlike most of television’s lead actors, Stephen Amell does intense training to be able to perform his own stunts and look the part of Oliver Queen. He also communicates regularly with his fans on social media and gives them spoilers for upcoming episodes, which are always filled with an astonishing take on the beloved vigilante’s story. If you like an action-packed plot intertwined with themes of love, friendship, and family, this show is definitely for you. Season three premieres October 8th at 8/7 central, and judging from the second season, this isn’t a premiere you want to miss. Next PostWhat’s SNU with Chapel Announcements?